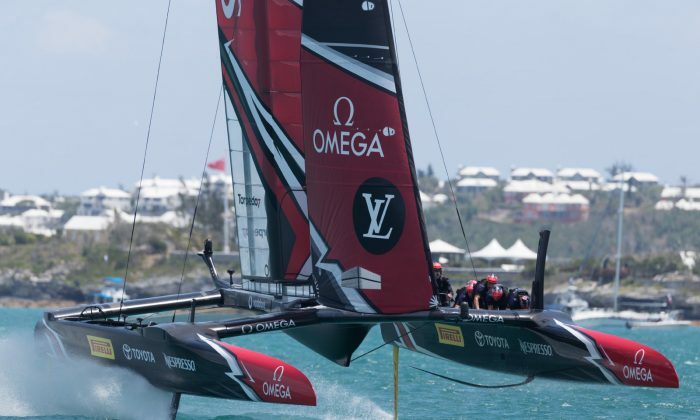 Going into the last day of the Qualifiers last Saturday June 3 Emirates Team New Zealand were leading Defending Champion Oracle Team USA by 1 point with a head to head race between the two teams to play. Oracle Team USA prevailed and also beat Land Rover BAR in their 2nd race to finish on top of the standings. This finishing position gives Oracle Team USA an important 1 point at the start of the Louis Vuitton America’s Cup series starting on June 17. As defending champions Team USA get automatic entry into the America’s Cup so will not take part in the Challenger semi-finals which started in Bermuda on June 5. Groupama Team France were eliminated after finishing bottom of the Qualifiers leaving four Challengers to contest the semi-finals over 9 races. Emirates Team New Zealand the dominant team of these remaining four teams in the Qualifiers are now facing-off against 3rd place finisher Land Rover BAR in the semi-finals. 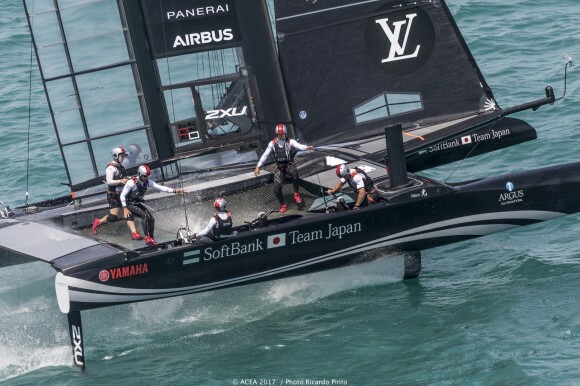 While SoftBank Team Japan face Artemis Racing in the other semi-final confrontation. After the first day of Semi-final racing Emirates Team New Zealand continued its impressive form snatching both points from opponents Land Rover BAR while in the other head to head SoftBank Team Japan and Sweden’s Artemis Racing look more evenly matched, winning one race each. But on day 2 (June 6) SoftBank won both races to take a 3-1 lead. Although Team New Zealand won race 3 they capsized in race 4 handing Land Rover Team their 1st point, but Team New Zealand still lead 3-1 in the series. The semi-finals were expected to complete in Bermuda on June 8 but racing was abandoned on June 7 due to winds over the 24 knot limit and choppy seas. The finish date will therefore be extended. No doubt Emirates Team New Zealand will be pleased with the delay following their horrendous capsize on June 6th. The playoff final between the two winning semi-finalists are planned to take place on June 10, 11 and 12 but this schedule may also be pushed back. There will then a break in America’s Cup proceedings while other events take place until the start of the Louis Vuitton America’s Cup, 13-race series with initial 4 races on June 17 and 18. There will then be another break in proceedings until the final 9 races are run from June 24 to June 27. Other events taking place during the overall time schedule are the Red Bull Youth America’s Cup qualifiers and final, and the America’s Cup Superyacht Regatta.